A decade ago, back when the web was still easy to develop webpages on, I was the WebMaster for TheRockCafe.com. (Don’t bother going there now, it’s a parked site for some internet squatter.) It was a website for a local record store here in my home town. (It later became the domain name for a church after the record store and I parted ways, but I had nothing to do with that.) Rather than pay me in cash, which I would have preferred, we had a barter deal. As a music lover, this worked out fine, as their website did not take much time to maintain once it was built, and in exchange I would get one music CD a week. I did it for three or four years. So my music collection, already fairly large at that point, got exponentially larger very quickly. This all leads, of course, to the point where I stopped listening to CDs and started listening to MP3 formatted music on my iPod. At that point, I used iTunes to convert all my music CDs to MP3, and never looked back. One tiny problem: while iTunes usually knew which CD it was importing, thus naming all the tracks and albums correctly, cover art was not a part of iTunes back in the day. The iPod could not display album art (greyscale text-only screen) and there was no decent third-party solution to find and attach album artwork to the metadata of the MP3. Even when the original iPod started sporting color and the ability to display album artwork, it was no big deal. It wasn’t until Apple introduced CoverFlow on the iPhone that I decided I wanted all my music to have album artwork. 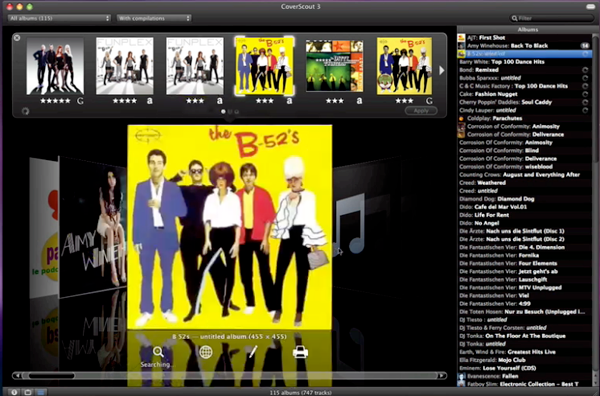 And while Apple now has the ability to find album artwork in iTunes, it does not work very well, if at all. Enter two different applications: CoverScout from Equinux, and TuneUp from TuneUp Media. They are very different applications, and while TuneUp has more features, I am only going to look at one feature: getting album artwork. TuneUp(Free, but limited to 500 fixes until you pay. $29.95 lifetime subscription) has the benefit of working with iTunes. When you launch iTunes, TuneUp automatically launches at the same time. This is nice, except I could not find any way to turn it off. Oh, sure, I could quit TuneUp, but there is no way to tell it not to launch the next time iTunes starts up. Maybe I don’t want to find missing artwork for the next few days. TuneUp doesn’t care, it happily launches each and every time. In fact, the only way to actually keep it from launching at iTunes start-up was to move the application to the trash, empty trash, and be happy. So, does TuneUp work? After a fashion. It does a pretty decent job of renaming your MP3’s for you if they are not already listed correctly. In fact, at times, it was downright uncanny how many songs it fixed in the ID department, correctly filling in both album name, composer, and song title. How does it know? Well, it does, at least for about half the tracks I threw at it. But this is about album art, and here TuneUp did a pretty decent job. Maybe 70%. Still and all, that is not bad, cleaning up 70% of the album art of the MP3s I gave it to chew on. 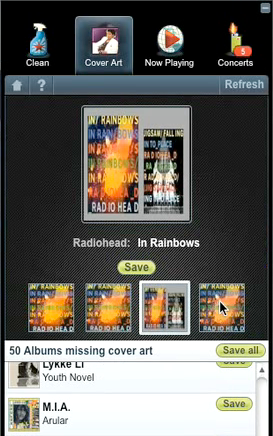 CoverScout($39.99), on the other hand, does one thing and one thing only: finds the missing album art. It does not work within, or with, iTunes. Rather, you point it at your MP3 library, and it will diligently scour the internet looking for your album art. I have to say, the power of CoverScout is astounding. Not only does it guess correctly 90% of the time, it presents you with multiple options for those tracks and albums if it does not know. You can set up the program to automatically assign the best guess for you, or allow it to let you manually select the correct choice per album. I did the later, until I got bored with the drudgery of the task and just let CoverScout pick what it thought was the best choice. Even then, it got it right way more often than not. CoverScout will also allow you to custom fit your covers, meaning if the only artwork it finds is a 3D or odd-shaped picture, you can crop out what you don’t want. More, you can actually use your iSight camera (if your Mac has one) to take a picture of your actual CD cover and apply that to your MP3s. If there is a problem with the artwork, you can change the levels of color or even straighten and rotate the art for a better fit. As a whole, I like both programs. TuneUp offers way more features than simply finding your missing artwork, and I really like the product. CoverScout is the best solution for missing album artwork, but it is a little pricey and only really does the one thing. I recommend both products, but ask that you give TuneUp a try before spending the money on CoverScout. For the sheer amount of missing artwork in my iTunes library, CoverScout is a bargain. But very few products beat free.